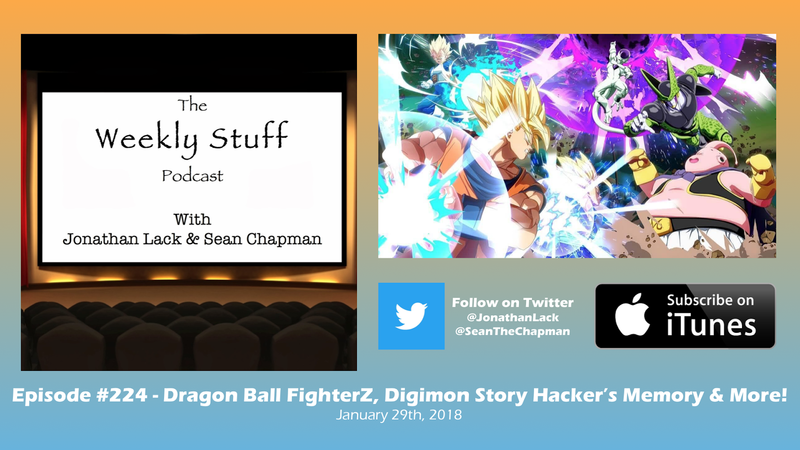 The Weekly Stuff Podcast #224 – Dragon Ball FighterZ, Digimon Story Hacker’s Memory and more! 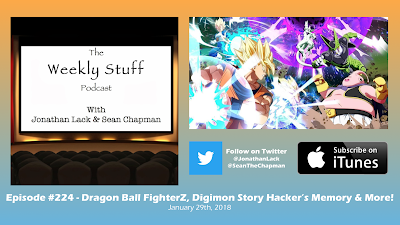 On today’s show, we review of two of January’s plethora of video game releases, diving into the fighting game that’s quickly taken the gaming world by storm, Dragon Ball FighterZ, and chatting about the sequel to 2016’s Game of the Year, Digimon Story Cyber Sleuth: Hacker’s Memory. These are two very different games that are sort of difficult to play on top of each other, but they’ve made for a rich start to the year in gaming. FighterZ is an amazing achievement in its genre that makes astoundingly good use of the Dragon Ball world and its characters, while Hacker’s Memory is just as clever, soulful, and surprising as the unexpectedly great JRPG it expands upon. And before we get to those reviews, we take a trip to Sean’s Beta Corner for thoughts on Metal Gear Survive, talk a little Doctor Who, and walk through some recent news, including an interesting Kotaku story about the state of Bioware and Anthem development.